Is my home eligible for rebates or an EnerGuide home evaluation? To access rebates through the Home Renovation Rebate and EfficiencyBC Program, or to have an EnerGuide home evaluation completed, your home must meet the eligibility criteria outlined below. Be connected with a current residential utility service account to FortisBC and/or BC Hydro. Electrically heated homes served by local municipal utilities within the service territories of BC Hydro or FortisBC (electricity) are also eligible. or side-by-side duplex, side-by-side row home or townhouse (provided that each unit has its own natural gas and/or electricity meter). Utility accounts in the name of a strata corporation are not eligible. Have 12 months of consecutive utility billing history for the period immediately prior to the installation of energy efficiency upgrade(s). Please note: Multi-unit residential buildings (such as high-rises and apartment buildings), garages, workshops, and out buildings are not eligible for the Home Renovation Rebate & EfficiencyBC Program. The building is resting on a permanent foundation(s) or is a permanently moored float home. There is a space heating system in place at the time of the evaluation that is capable (or was, in the case of a heating system failure) of keeping the interior living space at 21 degrees Celsius. The envelope is intact, including the exposed ceilings, exterior walls, exposed floors, windows and doors, and interior and exterior finishes (e.g., drywall, and exterior siding). Up to one window or door unit can be missing as long as it is temporarily air sealed (e.g., covered with plywood with seams and edges sealed with caulking). Any broken window panes must also be air sealed (e.g., with taped polyethylene) for the duration of the blower door test. If the temporary air sealing fails during the blower door test, the building will be considered ineligible. Any renovations underway only affect interior partitions of the dwelling and do not perforate the building envelope. There must be a supply of standard AC electrical power available. If power is not available from a utility, the homeowner must come to an agreement with the service organization about arranging for a suitable power supply to operate the blower door test equipment. For more information on eligibility requirements for energy evaluations for new homes please visit Natural Resources Canada’s Homebuilders webpage. For energy evaluations for mixed-use or multi-unit residential buildings, contact a program-qualified energy advisor or service organization in your area. What are EnerGuide home evaluations? An EnerGuide home evaluation is a comprehensive service designed by the federal government to help you improve the comfort and energy efficiency of your home. As part of the service, an energy advisor will come to your home and assess its energy performance. Energy advisors are building science professionals who will provide you with unbiased energy saving information, rather than selling any particular products or recommending particular contractors. Read more on Natural Resources Canada’s EnerGuide Home Evaluation info-graphic. What happens during a pre- and post retrofit EnerGuide home evaluation? Provide you with a Renovation Upgrade Report which gives you customized recommendations about which energy saving upgrades make the most sense for your home, and what energy savings you can expect from each upgrade. Issue you an EnerGuide rating, which demonstrates the energy performance of your home, and the EnerGuide Label which is the proof of that energy rating. Document the changes in your home since your pre-retrofit evaluation and calculate your new EnerGuide rating. The data will be used to create an updated label and Homeowner Information Sheet. If you are planning to access rebates, ensure that you have all of the necessary documentation for your application at this stage. If you are selling your home, consider including your EnerGuide rating in the MLS listing for your home to show a third-party verified confirmation of your home’s energy efficiency. For more details or to schedule an energy evaluation, contact a program-qualified energy advisor. What is an EnerGuide home label? After an EnerGuide home evaluation, you will receive an EnerGuide home label to affix to your electrical panel or another location. 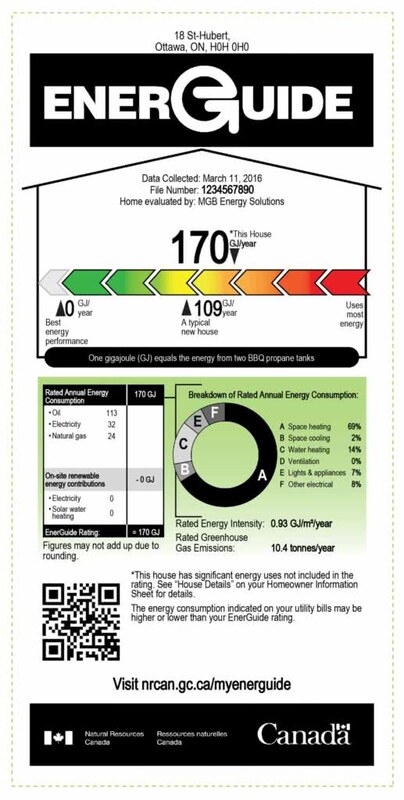 The EnerGuide label provides summarized information from your energy evaluation. Your EnerGuide rating: the modelled energy consumption of your home measured in gigajoules per year. The lower the rating, the less energy you consume. A typical new house reference: the EnerGuide rating your home would have if it had been built to current building code. Your current home’s rating may be more or less efficient than a brand new home. For a more detailed explanation of the EnerGuide Label, please view the EnerGuide Label Example and the Guide to the EnerGuide Label for Homes. What happens during a post-retrofit EnerGuide home evaluation? The energy advisor will return to your home and check your home’s energy performance after completing your upgrades and renovations. The advisor will document the changes in your home since your pre-retrofit evaluation and calculate your new EnerGuide rating. The data will be used to create another label and Homeowner Information Sheet. If you are planning on accessing rebates, ensure that you have all of the necessary documentation for your application at this stage. If you are selling your home, consider including your EnerGuide rating in the MLS listing for your home to show a third-party verified confirmation of your home’s energy efficiency. What are the benefits of an EnerGuide home evaluation? An EnerGuide home evaluation is the first step in a smart home energy renovation. An evaluation will help you make informed decisions about which upgrades would work best for your home, how to prioritize them and which will save you the most on energy costs. Speak with a professional energy advisor about the best options for your home to meet your specific goals to improve your home. Tell your energy advisor your goals and let them help you identify upgrade options for accessing rebates, reducing energy bills, improving home comfort, reducing your carbon footprint, improving home resale value, insulating your home from outside noise, or addressing other home issues related to energy efficiency. If you plan to apply for rebates, carefully read the terms and conditions for each rebate. Some rebates require a pre-retrofit EnerGuide home evaluation before installing upgrades and a post-retrofit EnerGuide home evaluation after your upgrades have been completed. Should I get an EnerGuide label if I’m thinking of selling my home? If you’re thinking of selling your home, it might be the perfect time to get an EnerGuide evaluation. Home sellers pro-actively obtain EnerGuide ratings for their homes and display the rating online. If you reside in Metro Vancouver, you can post your label on Metro Vancouver’s RateOurHome.ca website and link it directly to your property listing. Displaying an EnerGuide label will set your home apart from the rest. Homes that rate higher than typical should be proudly displayed. This tells the buyer that a new home was built beyond building code requirements in terms of energy efficiency. And for older homes the EnerGuide label can prove the home energy improvement investments made in the home. Consumers may request that an evaluation be conducted as a condition of sale. Taking the initiative to get an EnerGuide label and displaying it on your listing demonstrates transparency. Buyers appreciate listings that provide full disclosure of any potential issues or concerns. Displaying your EnerGuide label answers questions before they are asked and can speed up the transaction process. As interest in energy efficiency upgrades increases, there is an increased demand for REALTORS® to have an understanding of the value of the EnerGuide rating system. This is an opportunity for real estate agents to build their brand and differentiate themselves amongst REALTORS. Understanding the energy efficient features of a home elevates conversations with prospective buyers beyond the home’s aesthetic. The energy performance improvements made to a home and an EnerGuide label to prove it can be an important selling point to prospective buyers. It may show the home’s performance has been improved which in turn reduces the utility costs for any future occupants. An EnerGuide label is an official record of the home’s energy performance, and has potential to increase building value, resulting in a potentially faster sale at a potentially higher price. Has your client had an EnerGuide Home Evaluation done? Did they take steps in improving the energy efficiency of their home? Add their EnerGuide rating to the listing! Give buyers what they want. An improved EnerGuide rating can help your clients improve their comfort, save money on energy bills, and reduce their environmental impact. Find out what these improvements mean. Many energy efficiency upgrades can translate into benefits for the next homeowner. The benefits of an EnerGuide label go beyond utility costs and energy savings. High-performing homes offer quality of life benefits that buyers can emotionally connect to. For example, energy efficiency upgrades can improve the overall comfort of the home, including noise reduction, temperature regulation, and indoor air quality. These improvements can be important selling or purchasing features for a home. See our FAQ ‘What is an EnerGuide home label? What are the costs of an existing homes EnerGuide evaluation? The cost of an energy evaluation may vary depending on your location, the energy advisor or service organization you choose, the size and complexity of your home, whether or not you have a secondary suite requiring a second blower door test, additional services requested (thermal imaging) and other factors. We recommend calling different service organizations to obtain a quote and ensure that they are able to work within your renovation time frame. Existing home EnerGuide evaluations are conducted before and after retrofits are completed. Pre-retrofit evaluations typically range from $375 to $500 and may include additional fees. Post-retrofit evaluations typically cost between $200 and $300 and may include additional fees. Please note that GST and applicable fees may apply. For an accurate quote, contact a program-qualified energy advisor that services your area. Where can I find an energy advisor? To find an energy advisor and schedule an energy evaluation, use our list of program-qualified energy advisors. Select your Town or City from the drop-down list and the contact information of nearby energy advisors will be displayed. What types of homes are eligible for EnerGuide home evaluations? These requirements are specifically for existing homes, for example: single family detached homes, mobile homes on a permanent foundation, permanently moored float homes, low-rise, semi-detached, and row houses. In order for an EnerGuide evaluation to be conducted in your home, it must be in an eligible state. For more information on eligibility requirements for energy evaluations for new homes please visit Natural Resources Canada’s Homebuilders webpage; for energy evaluations for mixed-use or multi-unit residential buildings, contact a program-qualified energy advisor or service organization in your area. For additional home eligibility requirements to access rebates see What types of homes are eligible for the Home Renovation Rebate Program? Contact your energy advisor’s service organization. The contact information for the service organization can be found on the program-qualified energy advisor database. What can I do if there are no Energy Advisors currently servicing my location? The Home Renovation Rebate Program has individual upgrades that do not require an energy evaluation. Use the incentive search tool to find local government incentives that may be available for your location.